The priest Copres was an eyewitness of the doings of the venerable Patermuthius and recorded his life and miracles. St Copres narrated this Life to the presbyter Rufinus, who in turn transmitted it to Palladius, Bishop of Hellenopolis, who included the account in his book, the Lausiac History. 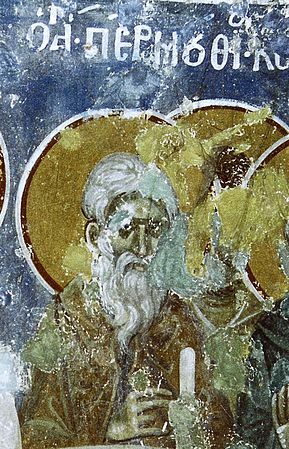 Once St Copres entered into a debate with the heretic Manicheus, and seeing that he could not prevail against him in dispute, he suggested that a large fire be lit, and that they should go into it together. In this way, the Lord Himself would decide whose was the true Faith. Manicheus refused to go in first, but Copres went into the fire, and standing in the midst of the flames, he remained unharmed. The people glorified the faith of Copres, and they threw the heretic into the fire. He jumped out all scorched and tried to flee, but they caught him and again cast him into the flames. St Copres then calmed the crowd and let Manicheus go.